This past Sunday, I picked up my handspun Briar Rose BFL, and wound it up to cast on for the March/April project, the Chickadee Cowl. Approximately 30 hours later, I was done. Wow. Fabulous, instant gratification, assisted by the fun of knitting with handspun, and a totally addictive combination of pattern stitch and color progression. Yarn: BFL handspun singles, dyed by Chris at Briar Rose Fibers for the Ply By Night SAL/KAL group on Ravelry. Needles: 16 inch US size 10.5/6.5 mm circulars. 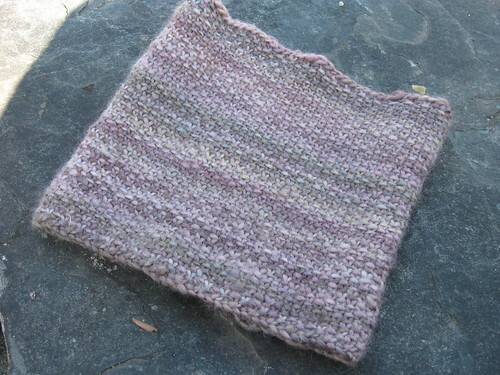 Gauge: totally off from the pattern, which called for 13 stitches/4 inches. Mine was about 20 stitches/4 inches. Thankfully, it stretches enough to fit over my big head, so anyone who might get it as a present should be ok. 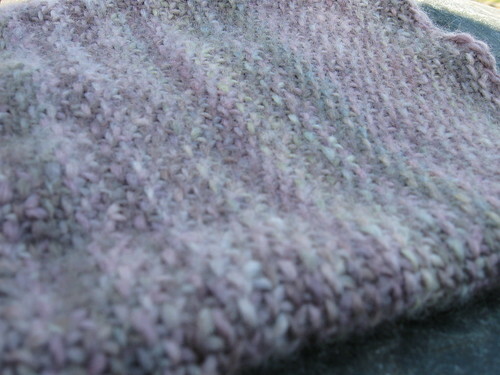 The yarn is lovely and soft, and has a phenomenal sheen. I will definitely be getting more fiber from Chris in the future, since it was so fun to spin and knits up so beautifully. Written by porpoise On May 4, 2009 In "FO", "PS Cardinal Directions", "PS North", "Ply by Night", "cowl", "spinning"